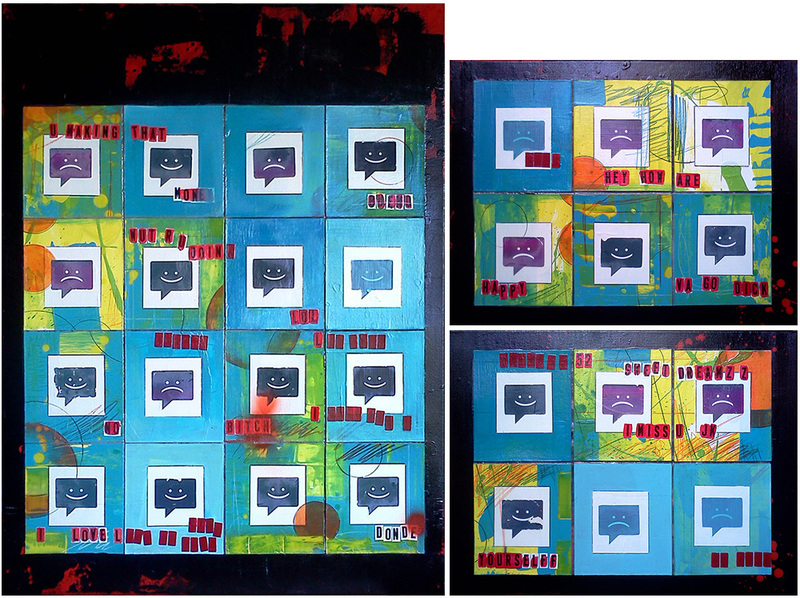 This latest work is a tryptic created primarily with acrylic paint, oil pastels, colored pencils, ink jet printouts on cardboard panels that are adhered onto three separate canvases. I was thinking about how our communication has become rather non-commital and impersonal through text messaging. We can’t hear the tone, sarcasm or dry irony through pop up messages on our phones – and that’s ultimately where the ‘disconnected communication’ comes in. Our ability to have a face-to-face conversation has eroded over recent years. However, this means a conversation we could control. We get to say exactly what we want, when we want to say it. Texting consumes no more time than we want it to, and to a much greater degree than is possible with a phone call. We can carefully edit what we say even before we say it. This entry was posted in New Work by Lesley. Bookmark the permalink.